Every neighborhood and community needs and deserves the ability to respond to emergencies quickly and effectively. This is best done by the neighbors themselves and better still if they can do it in an coordinated, knowledgeable coherent fashion. We therefore organize amongst ourselves and train with others who can be helpful in our training and in case the challenges facing us cross neighborhood boundaries or are too large for one of our teams to handle. Print out the three forms at the bottom of this article, and begin discussing them with a neighbor or two. 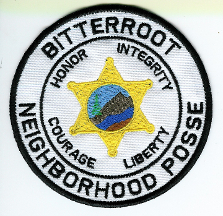 If your interest carries you far enough, invite a coordinator to help you begin organizing your neighborhood posse. Honorable adults have the right and responsibility to participate in the defense of, and emergency response for their neighborhoods. To this end, we join together forming a mutual-aid organization as outlined in this document. There is nothing confrontational about it, nor is there any question of the legality of our right to freely associate and assemble. 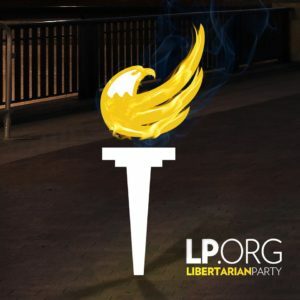 We take the responsibility to actively participate in the defense of our own life, liberty and property, as well as that of our families, neighbors and community. We renounce initiation or threat of force or fraud against persons or property as inherently illegitimate. We declare no war with any honorable, lawful and legitimate person, agency or government. We endorse The Oath Keepers and agree wholeheartedly with the ten orders they will not obey. By the way, there is not nor will there ever be an electronic list, database or home to the names or contact information of the posse members. Each neighborhood knows who to contact. It will stay there in their heads and on pieces of paper owned by each neighborhood posse. 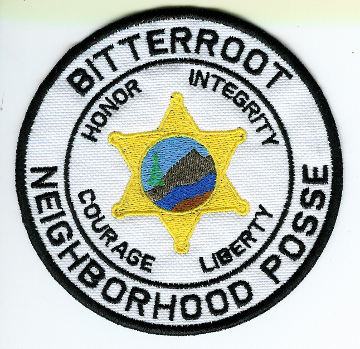 The coordinating group, Bitterroot Neighborhood Posse, is merely that: a coordinating, organizing and training tool available to each local team at their request. Those wearing the uniform of the Bitterroot Neighborhood Posse have signed the contract, agreed to the standards of conduct and earned their patch. The organization is no more and no less than that.